Our team, led by Co-Physician in Chief Sabet Hashim, MD, provides care to a wide range of patients – young or old, athletes or the elderly. Dr. Hashim, who performed the first heart transplant in Connecticut, has done more than 1,400 mitral valves repairs. Dr. Sabet Hashim is a board-certified cardiothoracic surgeon specializing in minimally invasive aortic and mitral valve surgery and repair. Dr. Hashim earned his medical degree from St. Joseph’s University School of Medicine, Beirut, in 1975. He received his general surgical training from Columbia University at St. Luke's Hospital in New York City. He joined the Yale University faculty after his cardiothoracic residency at Yale New Haven Hospital. He is presently the chairman of cardiac surgery and co-physician-in-chief of the Hartford HealthCare Heart & Vascular Institute. In 1984, while co-directing the Heart Transplant Program at Yale New Haven Hospital, Dr. Hashim performed the first heart transplant in the state of Connecticut. 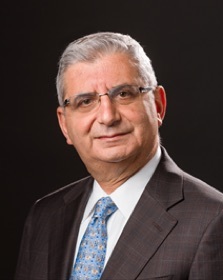 Dr. Hashim also developed multiple programs at Yale New Haven Hospital, including the Mitral Valve Repair Program (one of the first mitral valve repairs centers in the United States), the Atrial Fibrillation Surgery Program and the Minimally Invasive Aortic and Mitral Valve Surgery Program. Dr. Hashim performed the first mitral valve repair in New England. Since then, Dr. Hashim has consistently held the largest mitral valve practice in Connecticut and has performed over 1,000 mitral valve repairs. Today, he is internationally recognized as an innovator and expert in valve surgery. Dr. Hashim currently specializes in minimally invasive mitral valve repair, having developed novel techniques in this operation. Dr. Hashim pioneered the discrete sub-mammary incision for young women and has perfected the right anterior thoracotomy approach, which eliminates the need for sternotomy and shortens recovery time. Mariane Carna, RN, MSN, is a health care executive with broad experience in the development and growth of cardiovascular care. As a vice president at Yale NewHaven Hospital, she established a heart and vascular service line for the hospital and Yale Medical Group by building a collaborative governance and leaderships structure that contributed to significantly improve patient outcomes. Previously, Carna served as director of the cardiovascular service line at New York-Presbyterian Hospital/Weill Cornell Medical College, managing the strategic goals of the system's academic and clinical divisions. Most recently, she has been vice president of consulting with a technology firm that provides health systems with monitoring applications that improve workflow efficiency and support patient care.